The sense of eager optimism is palpable as Steve Wightman steers the small fishing boat towards open water, squinting in the sharp morning sun. Yesterday's catch is still on his mind. The 50kg crates were filled to the brim with fresh sea bass, cod and plaice, and there were 10 of them - enough to earn him and his brother Chris a healthy return for the day. Chris is equally ebullient as the boat makes way towards today's fishing grounds, just a couple of miles off the Suffolk coastline. "Too many people would want to get into it, had it been like this all the time," cheers Chris as he looks towards Lowestoft, still visible in the distance. 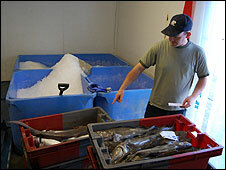 But there are good reasons why Steve, 38, and Chris, 33, are amongst the last of Lowestoft's fishermen. Days like these are the exception, and theirs is not an easy life even now. Long before most people will be reaching for their alarm clocks this morning, the two brothers are out at sea, digging into large tin baths of ready-baited fishing line which they slowly release abaft. Two-and-a-half miles of line, weighed down by a series of short chains and small anchors, is released in one direction before skipper Steve turns their boat Maximus to release a second line the same length. By 0830, just as the weather begins to turn and the two brothers wriggle into their oilskins, it is time to reverse the operation to see what they have caught. But as the line is swiftly pulled in by a machine, glistening hooks devoid of fish ping over the starboard side of the boat at eight feet intervals, a clear demonstration of how longline fishing is really hunting rather than gathering. "Skipper's not very happy at the moment," grins Steve bitterly as he impatiently taps the deck with his large boots. And then one of the anchors catches on the bottom and the line snaps. Four years ago, the two brothers scraped together more than £100,000 to buy Maximus, an inshore boat complete with satellite navigation equipment and a powerful engine that "gives us an extra two or three hours of home time a day", Steve says. But even so, he remains a foul-weather father who rarely sees his three children while the sun shines. "When the weather is good, we fish everyday," explains his brother Chris, whose first child is due later this year. The brothers' commitment to fishing is total. "Fishing is in our blood," says Chris, gazing up the seagulls that circle over the boat. "We like to say that they're all our ancestors." Adds Steve: "We bought our boat just as the beam trawlers were going out of business and the port was taking another downturn." At the time there were still seven or eight trawlers here, as well as some 20 inshore boats. These days, there are no trawlers left, their quotas having been sold to Dutch trawlers. 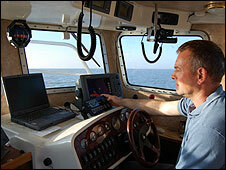 And most of the inshore boats have all but given up, not least because of escalating fuel costs. "We use about 700 litres of diesel a week," says Steve. "When we first ordered the boat, it was 25p a litre." These days, they pay more than 70p a litre, so their weekly fuel bill has almost tripled to about £500. Frustrated at the bad start to the day, Steve revs the engines and races over to the other end of the line. All is not lost, and soon their luck turns. The line is rolling in fast now, and Steve taps it eagerly with the long handle of a home-made hook, knocking off the seaweed, ready to hook in the fish as one by one they break the water's surface. Behind him, Chris stands ready to immediately kill and gut the fish as they come in. Specimens that are too small or species for which there is no market - such as smooth-hounds, a small shark that is abundant in these waters - are thrown back alive. Chris decides to keep one of the smooth-hounds. "It's good for kids, 'cos there are no bones in 'em," he says. "Anything you can do with a chicken, you can do with this." With popular fish, most notably cod, at risk of extinction, Steve and Chris believe consumers should be more adventurous and try new species, thereby helping to reduce the pressure on others. The two see themselves as keen conservationists and insist they are all in favour of measures that help preserve the fish stock, on which they rely for their livelihoods. Yet they have nothing good to say about the fisheries quota system, which they say is overly complicated and restrictive, "but they haven't saved any fish". "They put the quota system down each year, and then they base their quotas on the landing figures," says Chris, who believes small, inshore fishing vessels such as Maximus have a very small impact on the overall levels of fish stocks. For this reason, some scientists say it might be possible to relax the quota system for inshore vessels. Maximus is one of 30 boats taking part in a research programme, fishing outside the quota system for a year, to find out whether this would be viable in future. 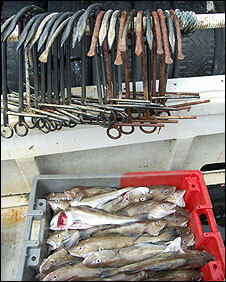 Small-scale fishermen are excited by the prospect, as the most crippling expense they face is the quota system. When they were initially introduced, the quotas were awarded to fishermen and trawler operators based on how much fish they were already landing. These quotas have become tradable assets that can be bought by and subsequently rented out by anyone. 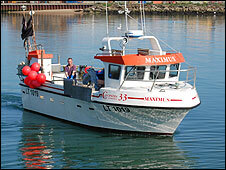 Returning to Lowestoft in the early afternoon, Maximus is greeted by an empty port. Like the rest of Lowestoft's dwindling fleet of boats under 10m, Steve and Chris used up what they describe as a meagre quota before Easter. Many have decided to cut back sharply on the number of days spent at sea. Steve and Chris are more ambitious than most, so they have decided to buy extra quota, even though this means they having to pay about £1/kg for the cod they land. With some 40% of the price they get for the fish from the merchants being paid directly to the quota owners, there is precious little left to cover costs and wages - not least since the prices they receive for their fish is already very low. "Prices vary according to how much fish is in the whole country, not just this port," explains Chris, pointing to how a large sea bass that might earn them £10 could provide several restaurant meals costing £30 a portion. "The fish we catch, if we were to sell it as fish and chips, we'd be millionaires." High costs, low prices, a shortage of quota and tough restrictions on fishing have combined to bring about the sharp decline in the fisheries industry, Chris believes. "It makes it very difficult for young people like ourselves to get on in the industry," says Chris, surveying the day's catch. "Enough to pay the bills, but nothing for us today," concludes Chris as he hoists four boxes of fish onto the dock. "You can sometimes go weeks without a wage, and then you make a month's wage in a day." 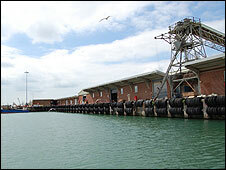 Portsmouth will help build two new carriers with budgets of almost £4bn.